I just finished listening to the Forbes webcast on cryptocurrency, and it was not bad! It was hosted by Jack Tatar, a finance veteran who has served as an executive to companies like JP Morgan and Merrill Lynch. In the webcast he covered the basics of cryptocurrency: what it is, how to trade it, and what the risks are. As someone who has been participating in the cryptocurrency world for a few years now, I didn’t exactly learn too many technical things. But this was the first time that I listened to somebody in the finance industry talk deeply about crypto, and it gave me some great new perspectives and insight. I specifically learned two things: crypto asset classification and crypto contract utilization. 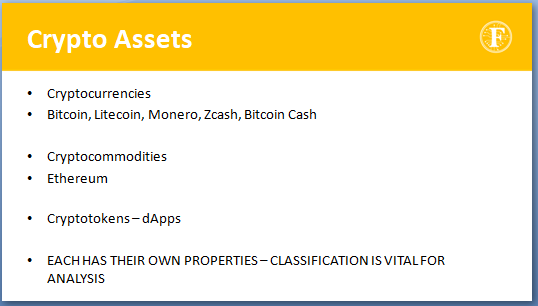 First, what is a crypto asset? When I first signed up to listen to the webcast, I assumed that by “crypto asset” they meant cryptocurrency. Well, in the crypto world, cryptocurrency is actually just one of multiple asset classes. In the webcast (and his book apparently), Tatar describes different types of crypto assets: cryptocurrencies, cryptocommodities, and cryptotokens. Tatar argues that although all of these assets rely on the underlying blockchain technology, distinguishing between them is important for analysis and investing. Yes they’re all crypto, but they have different uses and functions. I found this viewpoint of classifying the different kinds of cryptocurrency interesting. After a moment, I realized that this is completely valid idea. Bitcoin and Ethereum are commonly lumped together, for example, but they have vastly different ideologies. Bitcoin aims to be a true currency, meaning that people are meant to spend it to get goods and services. Ethereum is able to do that too, but the focus is different. Ethereum is a contracts based technology that aims to store transaction information such as contracts directly onto the blockchain. Cryptotokens aim to be similar to what a stock is: they represent the value of a part of a company. These are all crypto assets, but not necessarily cryptocurrency. 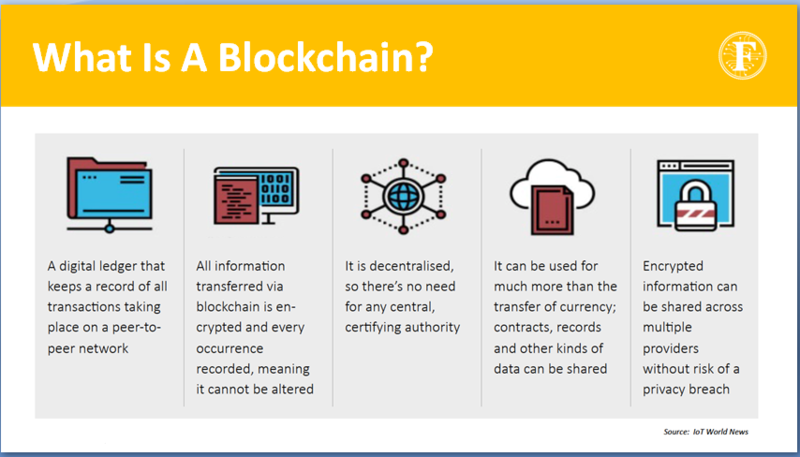 Secondly, why even use blockchain technology? This is something that I’ve had trouble understanding for a long time now. I’m not alone. Companies and people are still trying to utilize the blockchain in a way that isn’t done better using a different technology. It stores data but it’s not as good as database software. It can be used as currency but it isn’t as easy to use or as fiscally worth it as regular fiat. What’s the point? Well, this is the one aspect that I can now understand: the data that is stored on a blockchain is permanent. Why is permanency so important? Well, let’s take the data that is stored on a government database. Let’s just go ahead and for the sake of argument assume that the data is fully secure and usable. That database is essentially software that stores data onto a hard drive, accessible by a database administrator, who follows orders given to him by a superior. There is absolutely nothing technical preventing the database admin from modifying that data if he so chooses. And if he does modify that data, the original data may be lost forever. On a blockchain, that is impossible. Because the data on a blockchain is decentralized and copied onto thousands of machines all over the world, even if someone modifies their own local copy of the data, the consensus of all the other machines in the world will prevent that change from ever affecting the major blockchain. This aspect of truly permanent data, I think, has the potential to be world changing. Imagine a blockchain of information created in China, for instance, that holds data that can never be changed by the government. In a true decentralized blockchain, the government would be absolutely powerless to censure or retroactively change data that has already propagated into the world. Today, companies have already gone ahead and run this technology with contracts. Blockchain technology is incredible for contracts because once the contract is on the chain, it is irreversible. Both parties can forever refer to that piece of data on the chain to verify the contract. If the deed burns up, or one party claims something, the data can be verified on the blockchain. Absolutely nothing, not even the government, will be able to modify or delete that data.